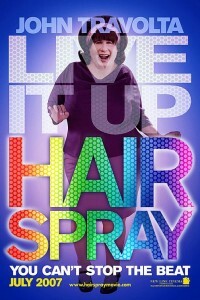 Wild About Movies recently sat with the entire cast and director, Adam Shankman, of Hairspray separately. 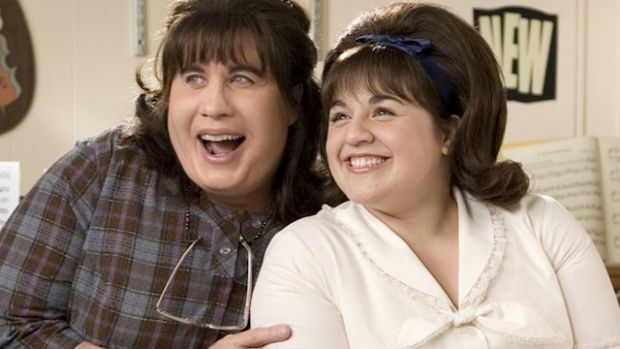 First up, John Travolta who dons a wig, a fat suit, high heels, and makeup to portray Tracy Turnblad’s mother, Edna. Wild About Movies: What about dancing in those high heels? Wild About Movies: What was your first reaction when you saw yourself in full makeup and the outfit and you got out there and you had to face the music? Wild About Movies: You’ve got these great eyes that come through. Do you think Edna was attractive? John Travolta: I said she just has to be pleasant to look at. I said I want a Delta Burke gone-to-flesh, her body’s like Elizabeth Taylor gone-to-flesh, meaning I wanted the obvious to be appealing, because film is different than stage. You can dress a guy on stage and you can do that joke where they’re like a refrigerator, but I don’t think that works as well at this level. I think you had to be watch-able. So it was only my own criteria that I injected. Wild About Movies: You and Christopher Walken dancing were so lovely. John Travolta: You know we’re old Broadway hoofers. He was my first choice, and I said, “We’ve got to get Chris, because he knows the language.” So we knew that, we got that down, we could discuss all that, and basically concentrate on the characterization. It was shorthand, you know, when we got together. Wild About Movies: When you talk about it, there’s this wonderful sense that there’s this pride in being an old hoofer. You’ve been there on Broadway and you’ve done the song and dance. Is it like a medal on the actor’s chest? John Travolta: It’s what was for Cagney, when Cagney used to say, “I was in Vaudeville,” is today’s “I was on Broadway.” It is. It’s a rite of passage of some sort. Now, I’m not saying I’m going back. It’s a tough rite of passage. I did thirteen years of it. Summer theatre, off-Broadway, Broadway, and whoa, enough is enough. It’s a lot of work, eight shows a week for a year or two at a time. But yes, I think it’s a certain rite of passage. Wild About Movies: Talk a little more about dancing with Christopher Walken – that’s such a wonderful scene. John Travolta: We’re both light on our feet, and we both have a sense of that history that I spoke of, so once he committed to being passionate about his wife, we were home. Once he said (doing a Christopher Walken voice impression)… “Oh, I got it. He’s crazy about her. They’re wild in the sack.” And I said, “Yes, you got it.” Then I could react flirtatiously, and I could react to that because it was energy coming at me. Where if he had played it distant or eccentric or something, instead he played it, he’s watching me dance and he’s smiling, and all that allowed me to be – and the idea that he prefers a size 60. Wild About Movies: Talk a little about the accent, Edna’s accent. John Travolta: Oh that, these are the things that I fought for and I won. Her curves, because they were determined to make her look like a refrigerator, I said, “Uh Uh, it’s not going to work, I won’t do it.” I said, “I want her to look like a woman.” I said, “Imagine Elizabeth Taylor, Sophia Loren, Anita Ekbert gone-to-flesh. That’s what I want.” And I won that. I kept sending the fat-suit back and back and back. And then the face we corrected lots of times. I said, “Okay, now, the accent, I can’t do New York, because she’s from Baltimore.” I said, “But if you let me do the Baltimore accent, it has a feminine quality to it, it’s nasal. ‘Listen hon, everyone’s going to go downtown,’ it’s naturally effete, for men and women.” So when I won that war, that argument, I knew that I was home free. But the accent was very important to me, because I think they were expecting me to do more of a New York thing and I knew that would make it more masculine and more identifiable to John Travolta, and I didn’t want that. Wild About Movies: Talk a little about working with Nicole Blonsky, because this is her first film. Wild About Movies: Wild Hogs was expected to do well, but no one thought it was going to be as huge a hit as it was. Were you personally surprised and are there any plans for a sequel? John Travolta: Two things: I was pleasantly surprised, but not that surprised and I’ll tell you why. The reason I did that movie is I said, “I want to see that movie if I’m in it or not. I want to see four guys on the road on motorcycles in a comedy, because I’ve never seen it before.” And the whole idea appealed to me, and the script was funny, I thought the choices of actors made it funnier, so it did and it didn’t. Now, I think it surprised a lot of people, including the studio because they expected maybe at best a $20 million weekend, and it ended up close to a $40 million weekend, and I think that was astonishing and it kept going, because now we’re at $250 million or something and it’s a phenomenal success. But I loved that – once in a blue moon you get an instinct about something. I’ll give you the movies I had it on, and not to say that I haven’t had a lot of other hits, but I had it on Grease, I had it on Wild Hogs, I had it on Phenomenon, I had it on – there’s another one that I had a surefire feeling about, what was it? Face/Off. And I’ve been fortunate to have had about 30 successful movies, but there’s sometimes where you just know something. Wild Hogs I said “It’s just going to hit.” I just think there’s a heartbeat of America that loves motorcycles, and that’s been going on for sixty years, since Marlon Brando it has been going on, but it’s been this hidden thing. And yes, there’s the real motorcycle guys, but there’s these weekend warriors, and I like them, meaning I feel like I’m a motorcycle driver and I just felt like there’s a heartbeat that had not been tapped yet in a comedy. Wild About Movies: What about a sequel? John Travolta: Yes, they want to do a sequel. Wild About Movies: Do you want to? John Travolta: I don’t know, I don’t know. I’m not big on sequels. I’ve done them but I like doing little things that have their own timelessness to them, classic type things, and then you go onto something new. Wild About Movies: Aren’t you doing something called Old Dogs? Isn’t that about guys in midlife doing something wacky? John Travolta: The difference is this is motorcycles and Old Dogs is about parenting. It’s like Robin Williams doesn’t know how to parent, and I’m teaching him how to be – and I have no clue about how to be a father and I’m teaching him how to be a father. So it’s a different setting. Wild About Movies: What was your favorite costume as Edna? John Travolta: I liked the polka dot dress, because it reminded me of the images I have of those screen people in the fifties, like Sophia or Anita Ekbert, that pattern was that. Most people think I would say that last number because it was awesome, like Tina Turner, but that polka dot dress seemed – I just think it defined something for me. Wild About Movies: What did Kelly (Preston, Travolta’s real life wife) say about your look? Did she have any comments? John Travolta: Kelly was onto this movie before anybody. She cried when she saw “Welcome to the Sixties.” When we were coming out in those pink dresses she was bawling. I said, “Why, what’s going on there?” She said, “I don’t know what it is, it’s just so happy, and mother/daughter.” She just had a thing about it that touched her. My daughter got a kick out of Edna. As a matter of fact, when Edna was mid-dressed, the prosthetic creates a flap, so she didn’t like when I was mid-dressed, because we called her Flapper. I said, “Do you like Edna?” She said, “I like Edna, but I don’t like Flapper.” Flapper was minus the breast, minus that and just the prosthetic on the face. Wild About Movies: Do you feel as a result of playing a woman you’re enlightened, do you feel you’ve experienced life on the other side? Wild About Movies: Did you ever wear it out? John Travolta: Nah, listen, it was so uncomfortable to be in. It was enough on the set. Wild About Movies: Career-wise do you think, “Okay, now I’m going to be playing this woman in this movie – where do I go from here”? Did you think about that at all or that maybe you’ve gone over the edge in terms of craziness? John Travolta: No. I’m the first guy who’s really played an actual woman on screen, but I don’t think I’m the first guy who’s acted as a woman. There’s Robin and there’s Dustin and Tony Curtis. This has been a done thing. The only real difference is I’m actually playing a woman versus drag. Wild About Movies: What’s next for you? John Travolta: Let’s see, what’s next? Old Dogs, and then Dallas I think will be up next, because they kind of have to do that movie. They’ve got five drafts and scripts and I’m meeting tomorrow with the director. Hopefully this director and this new writer will get it right, but they want to go after the New Year. Wild About Movies: Any other casting at this point? John Travolta: No. They really want to get – I’m the only one that they were completely sold on, and I signed. I’m already signed to do it. I can’t get out of it, unless the dates are so far off, then I can. Wild About Movies: If you didn’t like the script, you could get out? John Travolta: Yes, those two things. But what I’m saying is that if there’s a script that’s good enough to do, then I would be bound to that. Phoenix, Arizona - Classic, poetic, youthful. .